Ratty Old Shirts | THE GOOD . . . THE BAD . . . AND ME. Nope. I’m not [really] going to talk about my old shirts nor am I selling them because, frankly, they’re as good as rags. However, I still keep them. Viewing it from another’s perspective, I guess those shirts represent something metaphoric. I’ll tell you what . . . It just came to me while sorting out my laundry why I’m always washing one of my ratty old shirts — the one that looked like it got caught in a mine field with multiple holes in it (and I never bother to sew them close or mend them), almost threadbare with the faded logo of something in front (that I couldn’t remember what) from frequent washing. 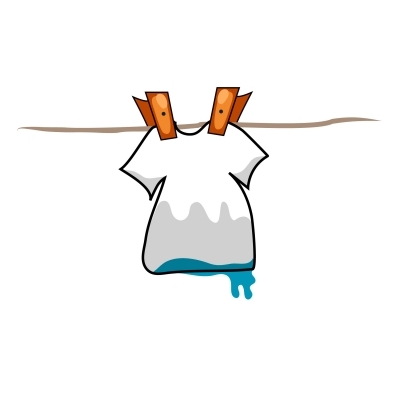 I just realized that for more than 15 years, I’ve been wearing and washing the darn thing at least once a week and it looked so pitiful yet I can’t seem to let go of it. It’s because despite its depressing condition, it’s comfortably soft from wear and it makes me sleep better at night. In a way, that ratty old shirt represents my comfort zone. I’ve had it for so long that I don’t even know if I’ll have the balls to throw it away anytime soon — not for sentimental reasons though. That thought ushered the question: Why is it so difficult to let go of something comfortable . . . something familiar . . . of something old and not as functional as when I first had it? It’s like I’m afraid that if I do let go, I’d be saying goodbye to an old, dear friend or leaving behind memories that I try to cling to. Maybe I’m just afraid of change . . . afraid to tread the unknown for fear of failure — just like breaking in a new shirt that might turn out to be scratchy or generally uncomfortable. For someone who’ve reinvented herself, doing something like The Confident Project to evolve into a person that “matters” and not just stay a wallflower forever, the disturbing reality that I still have my ratty old shirts spoke volumes on the human weakness I still have: I fear the inevitable and the unknown. Preparation is key. I want to be prepared to lessen the debilitating feeling fear creates. As far as I know, it has been a part of an easy transitioning to know what lies ahead so the change wouldn’t be too hard. But plans have a way of getting screwed up and then here comes the fear again, barreling its hefty bod ready to trample my positivity. Is the fear of stepping out of your comfort zone really a natural inclination? Is it really an inescapable part of change? Is there a way out of it? I am hoping and praying to all the powers in heaven and earth that there’s a way to squash fear because I need to have my head screwed on right. This year is going to open up a lot of changes in my life. Not only am I slated to move out of my apartment to a better one soon [cross fingers], I’m also gearing for a couple of big projects that I’m hoping [tongue in cheek] to finish all before the third quarter of this year. And being semi-superstitious and after a Feng Shui consultation, I’m full of drive and passion to see those projects through in this year of the wood horse. Naturally, behind all the enthusiasm lurks the debilitating fear. I guess — in a way — fear will balance out the enthusiasm and make me still cautious in my plans and execution . . . make me grounded, because failure is not an option anymore. I cannot procrastinate any longer. If I don’t do these now, I won’t be able to do them anymore.